I keep going on as being a child of the 70s and this is another post on similar lines. When I was a kid, we were all told that the Ruskies would drive across Europe at any second. There was nothing we could do to stop them as well. Not only that they would send nuclear missiles to wipe out major cities with only 4 minutes warning. This scared the government of the day and with the help of Public Information films got the message out. You’re all going to die!, sorry, you’re all going to be fine. Nothing to worry about. Just get back to whatever you were doing. The booklet, and accompanying films showed us what to do before, during and after the attack. What to listen out to. The different siren noises. What advice the radio would give you. How to dispose of the dead. 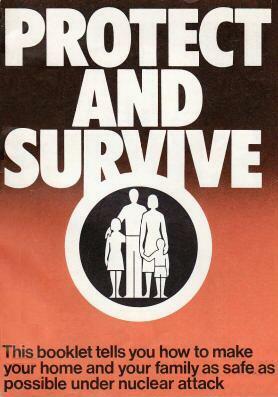 The booklet was called Protect and Survive and is ingrained in the mind of a generation. Some of the phases from the films were used in the Frankie Goes To Hollywood’s hit Two Tribes. The campaign probably wouldn’t have saved many lives but it would have given some hope to the general public. America had a similar idea. That was, around, 25 years earlier when the Cold War was thought to be on the brink of “getting very hot”. With that, combined with Senator McCartney communist witch hunts, the government released a series of information films. These used a turtle wearing a Civil Defence helmet. 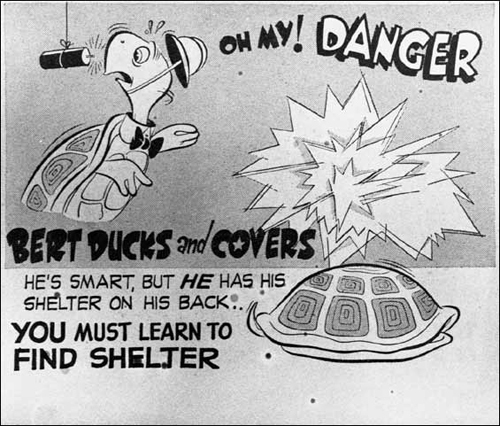 That campaign was Duck and Cover. This is more universally know in Britain than, I would assume, Protect and Survive is in America. It probably was a better campaign as it didn’t only apply to when the bombs were falling. From nuclear war to Earthquakes. The same principle applies. Stay away from windows and find something sturdy to cower under. Both campaigns were never needed as, strangely, the politicians managed to talk to each other and never make the Cold War a fighting one. They live on in the public psyche of the days when we could have destroyed the earth many times over. All down to an idealogical chasm. Just sit down and marvel at these wonderful gems of when we knew who the enemy was. Them darn Ruskies!